Grilling Pork Tenderloin, How To Grill for tenderness and juiciness. The pork tenderloin lies underneath the ribs alongside the backbone, parallel to the loin. Together the tenderloin and the loin make up the bone-in center loin roast and center loin chop. The tenderloin is very lean and extremely tender, a favorite of chefs, the world over. It has about the same amount of fat as boneless/skinless chicken breast and can be used in any dish calling for chicken breast. Pork tenderloin cooks very quickly, will dry out faster than most cuts but is still a very versatile cut. It can be roasted, grilled, sautéed, stewed, skewered or stir-fried. Tenderloin also takes well to marinades, rubs and glazes to help create a variety of grilled pork tenderloin recipes. This is optional, when grilling pork tenderloin brining it in a salt and sugar water solution followed with a dry rub will produce a tasty, moist tenderloin. If the pork you have purchased is enhanced or seasoned do not use a brine solution or add any salt to the recipe. 1. If the tenderloin you have purchased is seasoned or enhanced skip step one. 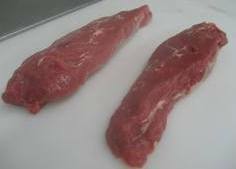 For grilling 2 unseasoned tenderloin dissolve about 3 tablespoons of kosher salt or 1½ tablespoons of table salt and about 1 cup of sugar in 4-5 cups of cold water in a large resealable bag or plastic container. Let the tenderloin sit in the refrigerator for 1-2 hours in the brine solution, turning the bag or tenderloins once. 2. Remove the tenderloin from the brine and pat dry with paper towel, rub with olive oil and season with your favorite BBQ dry rub. Allow the tenderloin to sit at room temperature about 1 hour before grilling. 3. If using a gas grill, first brush the grill with vegetable oil to prevent sticking, preheat on high for 10-15 minutes with the lid down. Scrape the grill clean with a grill brush, adjust the temperature to medium-high. 4. Grill on all fours sides about 3 minutes per side until nicely browned. For maximum flavor and tenderness cook to medium (145-150 degrees), anything more when grilling pork tenderloin will begin to dry out the meat. Remove the tenderloin, loosely tent 5-10 minutes, slice crosswise and serve. When cooking with a charcoal-grill, build a two level fire by stacking most of the coals on one side and the remaining coals in a single layer on the other side of the grill. Searing the tenderloin for 2½-3 minutes per side on all 4 sides over the high coals and then sliding them to lower heat to finish will create a nice brown crust without overcooking the center. 3. Meanwhile, light a fire filling with charcoal and allow to burn until covered with a thin layer of gray ash. Build a two leveled fire by placing 2/3 of the coals to one side, set the rack in place, close the cover and let the grill heat up another 5-10 minutes and clean with a wire brush. 4. Grill the tenderloin with lid up about 2½-3 minutes per side on all 4 sides on the hotter half of the grill. 5. Move the tenderloin to the cooler side and cover the tenderloin with an aluminum roasting pan about 3 minutes longer. This will help to bring the temperature up to medium doneness in the center portion of the tenderloin without overcooking the outer edges while still keeping a caramelized surface. For maximum flavor and tenderness cook to medium (145-150 degrees), anything more when grilling pork tenderloin will begin to dry out the meat. Remove the tenderloin, loosely tent 5-10 minutes, slice crosswise and serve. Below is a cooking chart for tenderloin. Remember you should always use an instant-read thermometer to check the doneness of pork. The internal temperature will rise about 5 degrees during resting time, remove the tenderloin 5 degrees before desired doneness. It is not recommended pork recipes bbq less than medium doneness. Always use an instant-read thermometer to check the doneness of a steak or chop. Stick the thermometer through the side of the meat deep into the meat but not touching the bone or fat. For maximum flavor and tenderness cook pork to medium (145-150 degrees), anything more will begin to dry out the pork. Always let your meat rest for 5 minutes before cutting, to redistribute and retain more juices. The temperature of the pork will rise about 5 degrees as they rest, remove 5 degrees before desired doneness. To avoid flare ups, trim closely, leave only thin layer of fat to preserve juiciness. Sear thicker steaks and chops on both sides with high heat, then cook over medium heat, high heat chars the outside before the inside is done.